During the third trimester, a baby's brain undergoes rapid development in utero. The cerebral cortex dramatically expands its surface area and begins to fold. Previous work suggests that this quick and very vital growth is an individualized process, with details varying infant to infant. Research from a collaborative team at Washington University in St. Louis tested a new, 3-D method that could lead to new diagnostic tools that will precisely measure the third-trimester growth and folding patterns of a baby's brain. The findings, published online March 5 in PNAS, could help to sound an early alarm on developmental disorders in premature infants that could affect them later in life. "One of the things that's really interesting about people's brains is that they are so different, yet so similar," said Philip Bayly, the Lilyan & E. Lisle Hughes Professor of Mechanical Engineering at the School of Engineering & Applied Science. "We all have the same components, but our brain folds are like fingerprints: Everyone has a different pattern. Understanding the mechanical process of folding — when it occurs — might be a way to detect problems for brain development down the road." Working with collaborators at Washington University School of Medicine in St. Louis, engineering doctoral student Kara Garcia accessed magnetic resonance 3-D brain images from 30 pre-term infants scanned by Christopher Smyser, MD, associate professor of neurology, and his pediatric neuroimaging team. The babies were scanned two to four times each during the period of rapid brain expansion, which typically happens at 28 to 30 weeks. Using a new computer algorithm, Bayly, Garcia and their colleagues — including faculty at Imperial College and King's College in London — obtained accurate point-to-point correspondence between younger and older cortical reconstructions of the same infant. From each pair of surfaces, the team calculated precise maps of cortical expansion. 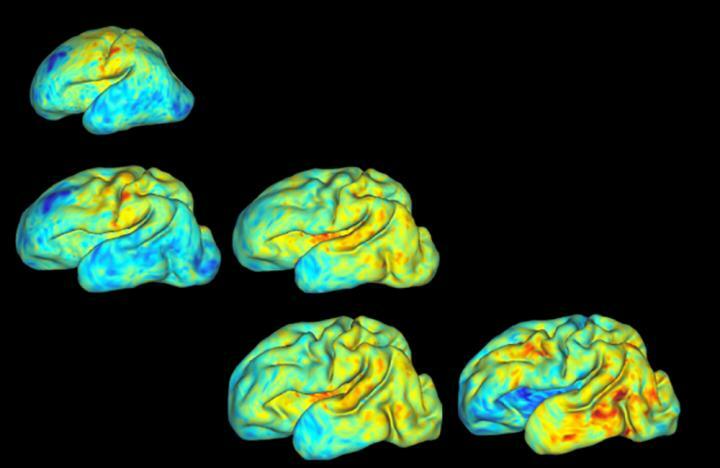 Then, using a minimum energy approach to compare brain surfaces at different times, researchers picked up on subtle differences in the babies' brain folding patterns. "The minimum energy approach is the one that's most likely from a physical standpoint," Bayly said. "When we obtain surfaces from MR images, we don't know which points on the older surface correspond with which points on the younger surface. We reasoned, that since nature is efficient, the most likely correspondence is the one that produces the best match between surface landmarks, while at the same time, minimizing how much the brain would have to distort while it is growing. "When you use this minimum energy approach, you get rid of a lot of noise in the analysis, and what emerged were these subtle patterns of growth that were previously hidden in the data. Not only do we have a better picture of these developmental processes in general, but doctors should hopefully be able to assess individual patients, take a look at their pattern of brain development, and figure out how it's tracking." It's a measurement tool that could prove invaluable in places such as neonatal intensive care units, where preemies face a variety of challenges. Understanding an individual's precise pattern of brain development also could assist physicians trying to make a diagnosis later in a patient's life. "You do also find folding abnormalities in populations that have cognitive issues later in life, including autism and schizophrenia," Bayly said. "It's possible, if medical researchers understand better the folding process and what goes on wrong or differently, then they can understand a little bit more about what causes these problems."